It was very easy to mix with a spoon in this small bowl. We recently had an interesting thread discussion in my La Leche League Facebook group about using deodorant without aluminum, which can be especially harmful for women since it's linked to cancer. When I was pregnant, I was diligent about using all natural deodorant, but then I got lazy. Most of the ones that I tried had to be reapplied very often. If you use a traditional commercial deodorant, it's also combined with an antiperspirant to reduce sweating. I had best success when I applied a crystal stick (antiperspirant) first, and then the natural deodorant. One of the moms shared a "recipe" to make your own deodorant. In fact, she's been making it for several years for herself, husband and even her family members. So, I decided to give it a try! I mixed this batch of deodorant this afternoon. It has three major ingredients: equal parts baking soda, arrowroot starch, and coconut oil. I've started to use coconut oil for more than just cooking. Because of it's in a solid state and contains antibacterial and healing properties, you can use it on a baby's bum to fight diaper rash or on a cut or scrape. Store the deodorant in a wide, small glass jar that will be easy to put your hand into to apply. 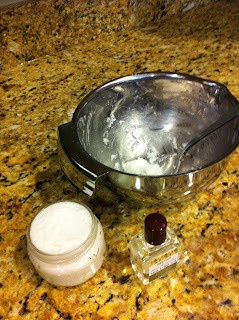 The blog post that I found has a tutorial for putting your homemade deodorant in your commercial container. Baking soda can irritate your skin if you use a lot of it so it's recommended to use a thin layer. I'm going to experiment with using the crystal stick first and then applying a very thin layer of the deodorant to see how it works for me. Since Aaron is going to try it as well, I decided to add a neutral scent using Tea Tree Oil. We have that oil on hand because we use it on our dog as a natural mosquito repellant. It smells fantastic! After my shower tonight, I applied the deodorant mix and it rubs into your skin very easily. I'll let you know how we like it! Here's the link to the original post with the recipe and tutorial. I also posted it to my Pinterest "For the Home" board. Have you tried your own deodorant? I don't think I can ever go back to commercial deodorant! I LOVE this stuff. It rubs into your skin so well without the annoying white flakes from commercial deodorant. It works for both me and Aaron and no funky body odor to report! Aaron was skeptical, but he was really impressed. We went on a hike and I sweat like crazy, but I wasn't smelly at all! That never would have happened with my old Secret. The one thing to watch in the warmer weather is the coconut oil will melt to liquid at 76 degrees. So you can put in the refrigerator and then bring it to room temperature before you apply it. Coming out of the fridge it's rock hard. You should try it! I loved this deodorant! And I usually have a hard time finding deodorant that doesn't make me break out. It really works! Do you have any tips for natural fabric softener or dryer sheets? Since I have sensitive skin, I don't use either, but would like to freshen up the laundry! I'm so glad! It's become quite a hit! Have you heard of dryer balls? I've seen some sold on Etsy. They're usually made of wool and some have natural essential oils for a delicate scent. I've never tried it, but I've heard good things about them! Plus, they can cut your drying time too.